Home > ENTERTAINMENT > Sheldon Cooper and Joey Tribbiani as roommates!!! F.R.I.E.N.D.S is one of the best Sitcoms of all time. No doubt about that. No wonder almost everybody watches it. But if you are a diehard FRIENDS fan, you know the pain you feel when it’s finally over. It’s like the end of an era! What do you do next? Look for shows that are similar to your all time favorite show. You ask people which show to watch next and mostly you land on How I Met Your Mother and The Big Bang Theory. Let me tell you, these three are my favorite shows ever, so I can’t help but be a little imaginative. Just the other day when I was watching TBBT, a thought came to my mind. 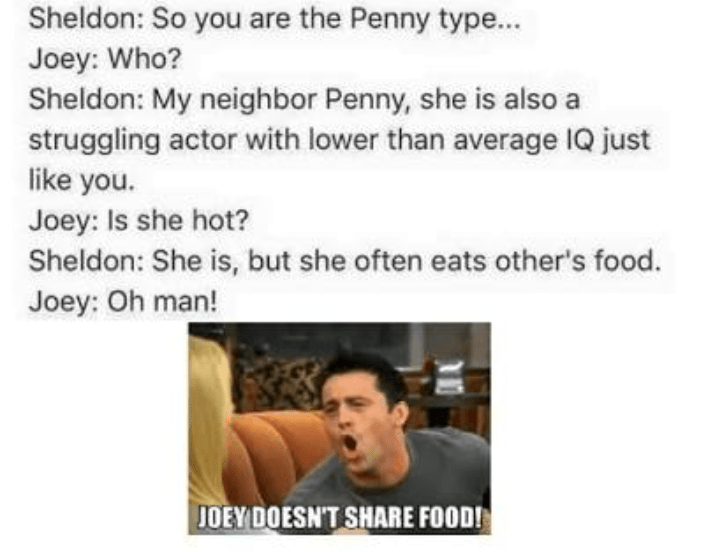 What if Sheldon Cooper from The Big Bang Theory and Joey Tribbiani from FRIENDS were roommates? Below I have listed 11 instances in which their conversation could have taken place. Let us take a look.